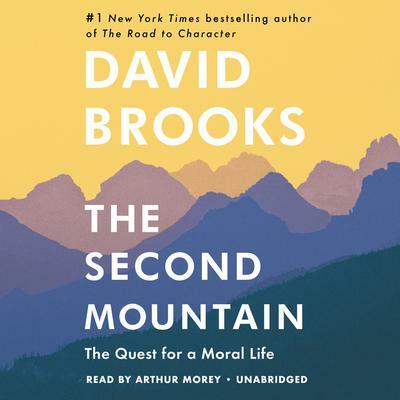 The Second Mountain - Audiobook | Listen Instantly! In short, this book is meant to help us all lead more meaningful lives. But it’s also a provocative social commentary. We live in a society, Brooks argues, that celebrates freedom, that tells us to be true to ourselves, at the expense of surrendering to a cause, rooting ourselves in a neighborhood, binding ourselves to others by social solidarity and love. We have taken individualism to the extreme—and in the process we have torn the social fabric in a thousand different ways. The path to repair is through making deeper commitments. In The Second Mountain, Brooks shows what can happen when we put commitment-making at the center of our lives. Download and start listening now! David Brooks writes an op-ed column for the New York Times. Previously, he has been a senior editor at the Weekly Standard, a contributing editor at Newsweek and the Atlantic Monthly, and an op-ed editor at the Wall Street Journal. He is currently a commentator on PBS NewsHour and contributes regularly to Meet the Press and NPR’s All Things Considered. He is the author of Bobos in Paradise: The New Upper Class and How They Got There and On Paradise Drive: How We Live Now (And Always Have) in the Future Tense. His articles have appeared in the New Yorker, New York Times Magazine, Forbes, the Washington Post, Times Literary Supplement, Commentary, The Public Interest, and many other magazines. He lives in Maryland. Arthur Morey has won three AudioFile Magazine “Best Of” Awards, and his work has garnered numerous AudioFile Earphones Awards and placed him as a finalist for two Audie Awards. He has acted in a number of productions, both Off-Broadway in New York and Off-Loop in Chicago. He graduated from Harvard and did graduate work at the University of Chicago. He has won awards for his fiction and drama, worked as an editor with several book publishers, and taught literature and writing at Northwestern University. His plays and songs have been produced in New York, Chicago, and Milan, where he has also performed.